The Ewa-Marine U-BXP100 TR housing is specially designed to fit the bulky, professional digital SLR cameras such as the Canon 1Ds or the Nikon D2X, D200 and similar cameras. Smaller SLR cameras can still be used in the housing. The housing is manufactured from double laminated PVC and has an optical glass port. It is rated for dives of up to 155' (50m) depth. 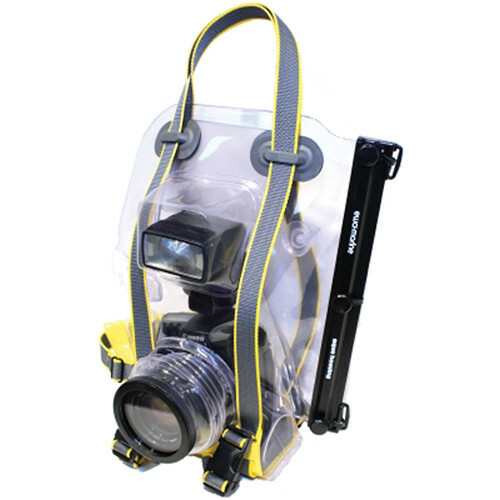 Perfect for snorkeling, diving, sandy, dusty, humidity or foul weather conditions. This housing will give your camera the best possible protection while being fully operable. You can even attach the housing to a tripod. If the optional BF1 lead weight is inserted into the housing, underneath the camera, it becomes even easier to reach the maximum depth. The auto focus of the camera continues to function perfectly. As you descend, the air is pressed into the camera. Due to this, the pressure inside the housing will remain the same as the surrounding water pressure (this is the reason why ewa-marine housings are so safe to use: implosions are impossible). Due to this, we have to start the dive with a suitable amount of air inside the housing. The foam pads supplied with the housing are part of this air "reservoir" and additional air should also be blown into the housing, via the valve at the rear, to ensure that the maximum volume is being utilized. Box Dimensions (LxWxH) 17.0 x 12.0 x 5.0"
U-BXP100 TR Underwater Housing is rated 2.0 out of 5 by 2. Rated 1 out of 5 by Olar from For snorkeling is OK, but not for diving I put 1 star because Eva Marine is giving depht rating 50 meters but this is wrong by my opinion. I read very carefully manufacturers manual and I did as there was written. So I went with this housing to 10 meters underwater and it started leaking from piece where you can blow air to the housing. I lost camera with lens and flash. Rated 3 out of 5 by Anonymous from Difficult to use. Good price. Works. I bought it for my Canon 7D so I could do some underwater photography in a trip I did recently. I found it difficult to use, specially when you go deep and the air inside the housing gets compressed. I think practice will make it easier and it can be a good way to get into underwater photography, as it isn't as expensive as an underwater case. However, as soon as I get the money, I think I will be heading to Ikelite which seems a lot easier to use. Unlike the other person who wrote a review, I didn't have any problem with water coming in. I went down to 20 meters deep and everything was perfectly dry. The instruction manual is very short. They could work on that. whats the difference between UBXP100 and UBXP100TR ???? The UBXP100 and UBXP100TR are the same bag housings. The UBXP100TR has a tripod socket on the bottom. Hello Alex. any lens that has a filter diameter of 82mm or less (utilizing step down rings)and the total length of lens and body is maximum 8 inches will fit in this housing.